​The Mission of The Outdoor Circle is to keep Hawaii clean, green, and beautiful for future generations by preserving, protecting, and enhancing our environment. The Outdoor Circle (“TOC”) is the state’s oldest and most respected environmental preservation organization. It is perhaps best known for the banning of billboards throughout the islands in 1926. Throughout the years, TOC has expanded its scope to include green space protection, view corridor preservation, tree advocacy and many other issues that impact the quality of life for our residents and visitors. It operates only in the state of Hawaii and has seven currently active branches. It was established in 1912. See TOC State Office website page for the full history. The Greater Waikiki Branch was begun in January 2016 to address issues relating to the unique urban environment of the state’s most important economic center. Its District includes Waikiki (from Ala Wai Canal to beaches), Ala Moana Park and Kapi’olani Park. Waikiki is arguably the most beautiful destination in the world. It is also the economic engine of the State of Hawaii and the center of its thriving international tourism industry. Each day about 150,000 people are in Waikiki to work, play and live and roughly 40,000 residents call it home. Waikiki generates about 46% of the state's visitor industry expenditures, 8% ($5 billion) of the Gross State Product and 11% of all jobs. Among the many reasons it is such an acclaimed paradise are its stunning heritage of trees and its freedom from the visual blight of billboards and most other forms of outdoor advertising. ​The History of Waikiki is a topic we will be studying in the next few months. In the meantime, please look at our History page. ​Once a place of streams, fish ponds and taro-growing mud fields, the area was changed forever when the dredging of the Ala Wai Canal, which opened in 1929, transformed the geography and created Modern Waikiki. 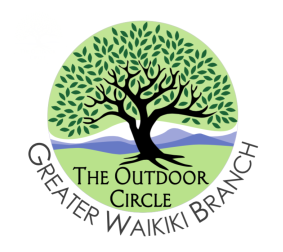 Join The Outdoor Circle and choose Waikiki as your Branch Affiliation. ​Your annual membership dues gives you membership to both The Outdoor Circle and the Waikiki Branch! We'll add you to our monthly mailing list and soon you will be able to download all our Walks Maps and Guides.